To Cite: Goudarzi M, Mohammadi A , Goudarzi H , Fazeli M , Sabzehali F . Genetic Variability and Integron Occurrence in Methicillin Resistant Staphylococcus aureus Strains Recovered from Patients with Urinary Tract Infection, Arch Pediatr Infect Dis. Online ahead of Print ; 7(2):e86189. doi: 10.5812/pedinfect.86189. Background: Treatment for infections caused by Methicillin-Resistant Staphylococcus aureus (S. aureus) is one of the main concerns of public health. Objectives: The aim of this study was to investigate the prevalence of toxin, enterotoxin, and resistant encoding genes and analyze the distribution of different SCCmec types. The prevalence of integron was also determined in S. aureus isolates obtained from patients with urinary tract infections (UTIs). Methods: In the present study, 126 MRSA isolates obtained from patients with UTI were examined for susceptibility to antimicrobial agents. Genes encoding integrase, resistance, toxin, and SEs were detected by the polymerase chain reaction (PCR) screening. The SCCmec types were determined using the multiplex PCR. Integrase positive strains were evaluated for determination of integron classes using PCR-restriction fragment length polymorphism assay. Results: From 126 MRSA isolates studied, 107 isolates (84.9%) were multi-drug resistant. The most prevalent genes in isolates under study was aac (6΄)-Ie/aph (2˝) (50%) followed by tet (M) (47.6%), msr (A) (38.1%), aph (3΄)-IIIa (25.4%), erm (A) (23%), ant (4΄)-Ia (16.7%), erm (B) (14.3%), msr (B) (9.5%), and erm (C) (7.1%). Staphylococcal enterotoxins sea, sec, see, sed, seg, seb, and sei were detected in 27%, 20.6%, 16.7%, 14.3%, 11.1%, 7.1%, and 5.6% of the isolates, respectively. The results revealed that 126 MRSA isolates fell in the SCCmec type III (37.3%), SCCmec type I (23%), SCCmec type II (14.3%), SCCmec type IV (13.5%), and SCCmec type V (11.9%). Class 1 and 2 integrons were commonly found in 34.1% and 14.3% of the isolates, respectively. Seven isolates (5.6%) were observed to carry class 1 and 2 integrons, simultaneously. Conclusions: The current findings showed that identification and screening of integrons and SCCmec elements as reservoirs that should be considered for various resistance genes to consume proper antibiotic and perform a systematic surveillance. Urinary tract infections (UTIs) are among common bacterial infections, which annually influence more than 150 million people around the world. Furthermore, UTIs can infect both genders but they are more prevalent in females than their male counterparts (1, 2). They are a significant cause of death for females of all age groups, children, and older males and nearly all people experience at least one episode of UTI during their lifetime (2). Urinary Tract Infections are a severe public health problem that cause considerable economic and public health burdens and have a significant impact on the life quality of people with the disease. A wide range of pathogens, including gram-negative and gram-positive bacteria, as well as certain fungi, cause the disease (2, 3). Although the most common causative agents are Escherichia coli, Klebsiella pneumonia, and other Enterobacteriaceae, Staphylococcus aureus (S. aureus) as an uncommon cause of UTI, represents 0% to 6% of urinary samples and is important as a primary urinary pathogen among long-term care patients. It has been well-documented that catheterization increases the risk of S. aureus carriage in the urinary tract (3). According to previously published data, although UTI causes low mortality rates, antimicrobial therapy should not be ignored (1, 4). It has been well-documented that one-third of patients with S. aureus bacteriuria have a symptomatic urinary tract infection and are highly recommended for treatment with antibiotics (3). Although antimicrobial therapy has significantly reduced mortality rate from S. aureus infections, it can lead to the development of resistance mechanisms to antimicrobial agents (5). However, UTI treatment associated with S. aureus, which is now most often multi-resistant, is limited, owing to the widespread emergence of an array of antibiotic resistance mechanisms (4). The prevalence of Methicillin-Resistant S. aureus (MRSA) strains has significantly increased over the years, posing a major public health concern (6). The mecA gene has a large heterologous mobile genetic element called Staphylococcal Cassette Chromosome mec (SCCmec) for carrying resistance to methicillin. Considering the genetic content and structural arrangement of SCCmec, eleven different types have been reported (7). Mobile genetic elements, such as plasmids and transposons, can disseminate antibiotic resistance genes through horizontal gene transfer mechanisms. In the recent years, the role of integrons as a key system involved in spreading antibiotic multi-resistance has been well-established (8). Despite being motionless, integrons may be transferred by mobile genetic elements (9, 10). Based on the homology of integrase gene, several classes of integrons have been described, which are related to antibiotic multi-resistance. Class 1 and 2 integrons are commonly identified in clinical S. aureus isolates, while reports are limited regarding other classes (10). Unfortunately, integron detection in clinical isolates of MRSA is not routinely performed and their presence is therefore missed. Screening for integrons in MRSA strains and its relationship with antibiotic resistance can be a useful tool for studying molecular epidemiology and also the management of infection (10). The aim of this study was: (i) to characterize the antibiotic resistance pattern, toxin, staphylococcal enterotoxins (SEs) and resistance encoding genes; (ii) to determine the prevalence of integron; and (iii) to determine molecular types of MRSA strains using SCCmec typing in S. aureus isolates, obtained from UTI. After screening 1425 urine samples from patients reporting UTI, 126 MRSA isolates were recovered between February, 2016 and March, 2018. Before collecting the samples, all the patients gave their verbal informed consents. The Ethics Committee of Shahid Beheshti University of Medical Sciences (Tehran, Iran) also approved this study (IR.SBMU.MSP.REC.1396.809). Thermal boxes containing the samples were sent to the laboratory under refrigeration and immediately homogenized and inoculated on agar plates. After incubating the plates for 24 to 48 hours under aerobic conditions at 37°C, the colony count was measured. The UTI was defined as a positive urine culture for S. aureus with a colony count of ≥ 105 CFU/mL. Standard biochemical tests, such as growth on mannitol salt agar, colony morphology on blood agar, and coagulase, DNase, and catalase production assays, were used to identify S. aureus isolates. A PCR assay targeting the S. aureus-specific nuc gene was performed for definitive identification of presumed identified isolates as S. aureus species (11). For MRSA screening, phenotypic growth was investigated around the cefoxitin disc (30 µg) and placed on plates of Mueller-Hinton agar (Merck, Germany), containing 4% NaCl. Also, the PCR method was applied for genotypic amplification of mecA genes (11). All the strains harbored the mecA gene and were confirmed as MRSA. Based on the Clinical and Laboratory Standards Institute (CLSI) guidelines, standard Kirby-Bauer disk diffusion method was applied for the in vitro assessment of antimicrobial susceptibility to antimicrobial agents (Mast Diagnostics Ltd., Merseyside, UK), including tetracycline, erythromycin, clindamycin, ampicillin, trimethoprim-sulfamethoxazole, gentamicin, ciprofloxacin, and amikacin in MRSA isolates (12). The minimum inhibitory concentration (MIC) was measured using the broth microdilution test for vancomycin and fusidic acid (12). The MIC cutoff points for vancomycin based on the CLSI criteria were as follows: resistant, ≥ 16 µg/mL; intermediate, 4 to 8 µg/mL; and susceptible, ≤ 2 µg/mL. The guidelines of the European Committee for Antimicrobial Susceptibility Testing (EUCAST) were applied to interpret the results of resistance to fusidic acid. The resistance of MRSA strains to three antimicrobial categories (or more), besides beta-lactams, was defined as multidrug resistance (MDR) (13, 14). For quality control, S. aureus ATCC25923 and ATCC29213 strains were used in each run. A QIAamp DNA mini kit (Hilden, Germany) was employed for the extraction of total genomic DNA, based on the manufacturer’s protocols; nevertheless, lysostaphin (15 µg/mL) was added for cell wall lysis. 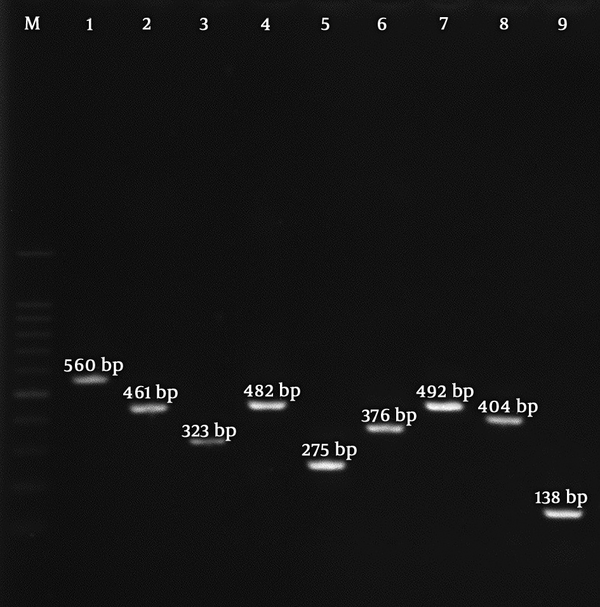 The PCR was performed to determine the presence of resistance (mecA, vanA, vanB, erm (A), erm (B), erm (C), msr (A), msr (B), tet (M), ant (4΄)-Ia, aac (6΄)-Ie/aph (2˝), aph (3΄)-IIIa) (15-19), toxin (etb, eta, pvl, tst) (11, 13) and SEs (sea, seb, sec, sed, see, seg, seh, sei and sej) (20) encoding genes. Multiplex PCR amplification was carried out with specific primers for SCCmec typing, as suggested by Boye et al. (7). The controls included MRSA strains, i.e., ATCC 10442, N315, 85/2082, MW2, and WIS (SCCmec type I, II, III, IV, and V, respectively). According to a study by Goudarzi et al. (14), integrase genes were detected, using specific primers for the conserved sites of integron-encoded integrase genes (intI1, intI2, and intI3) (21). 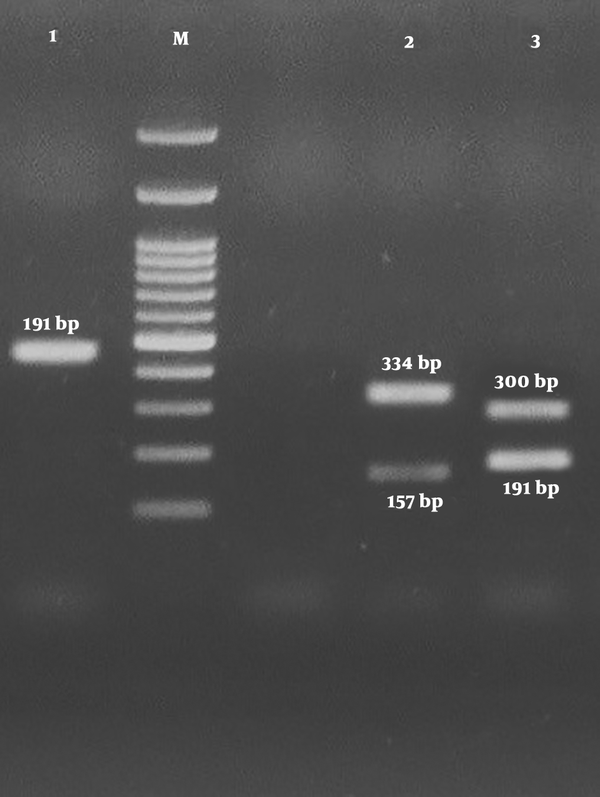 To determine different classes of integrons, PCR-positive products were exposed to RsaI and HinfI restriction enzymes. Using electrophoresis on 1.5% agarose gel, the digested patterns were examined. For RFLP reactions, a final volume of 20 µL, including the integrase PCR product (10 µL), specific buffer (2 µL), double distilled water (7 µL), and 10 U RsaI and HinfI restriction enzymes (1 µL), were used (21). To analyze the collected data, SPSS version 18.0 (SPSS Inc., Chicago, IL) was used. Of 126 MRSA strains obtained from patients, 93 (73.8%) isolates belonged to female patients and 33 (26.2%) to male patients. The patients’ average age was 36 years (median, 39.1, range, 4 to 65). The patients were distributed to three age group; ≤ 20 years old (30 patients, 23.8%), 21 to 45 years old (81 patients, 64.3%), and 46 to 65 years old (15 patients, 11.9%). The results of antibiotic susceptibility testing revealed high levels of resistance in the isolates including to ampicillin (126/126, 100%), gentamicin (88/126, 69.8%), tetracycline (83-126, 65.9%), ciprofloxacin (76/126, 60.3%), erythromycin (71/126, 56.3%), clindamycin (52/126, 41.3%), amikacin (46/126, 36.5%), and trimethoprim-sulfamethoxazole (39/126, 31%). None of the isolates were susceptible to all of the tested antibiotics. The predominant resistance profile included resistance to four antibiotics (38.1%, 48/126), followed by five antibiotics (22.2%, 28/126), eight antibiotics (11.9%, 15/126), six antibiotics (13/126, 10.3%), and three antibiotics (13/126, 10.3%), simultaneously. All the MRSA isolates were susceptible to vancomycin and fusidic acid. The results of vancomycin MIC showed that 43 (34.1%) isolates had MIC ≥ 0.5 µg/mL, 39 (31%) had MIC ≥ 1 µg/mL, 41 (32.5%) had MIC ≥ 2 µg/mL, and 3 (2.4%) exhibited MIC ≥ 4 µg/mL. Fusidic acid could inhibit all the strains at similar MIC50 and MIC90 (0.25 µg/mL). Of the 126 MRSA isolates, 84.9% (107/126) were defined as MDR. Out of 126 MRSA clinical isolates examined, iMLSB and cMLSB were detected in 19 (15.1%) and 52 (41.3%) MRSA isolates, respectively. Analysis of resistance encoding genes among tested MRSA strains showed that the most prevalent resistance gene was aac (6')-Ie/aph (2") (50%, 63126) followed by tet (M) (47.6%, 60/126), msr (A) (38.1%, 48/126), aph (3')-IIIa (25.4%, 32/126), erm (A) (23%, 29/126), ant (4')-Ia (16.7%, 21/126), erm (B) (14.3%, 18/126), msr (B) (9.5%, 12/126), and erm (C) (7.1%, 9/126). All isolates with inducible and constitutive resistance carried one or more macrolide resistance gene (s). Among the isolates with constitutive phenotype, the msr (A) gene was the most prevalent (78.8%, 41/52) followed by erm (A) (44.2%, 23/52), erm (B) (23.1%, 12/52), msr (B) (19.2%, 10/52) and msr (C) (17.3%, 9/52) while msr (A) (36.8%, 7/19), erm (A) (31.6%, 6/19), erm (B) (31.6%, 6/19), and msr (B) (10.5%, 2/19) genes were much more common in the isolates with the inducible phenotype. As shown in Table 1, 54 isolates (42.9%) harbored three resistance genes, 27 isolates (21.4%) two resistance genes, and 19 isolates (15.1%) four resistance genes, simultaneously. The findings revealed that 26 isolates did not indicate any carriage of resistance gene. Regarding the presence of SEs genes, the most prevalent gene was sea (n = 34; 27%), followed by sec (n = 26; 20.6%), see (n = 21; 16.7%), sed (n = 18; 14.3%), seg (n = 14; 11.1%), seb (n = 9; 7.1%), and sei (n = 7; 5.6%). None of the isolates carried seh and sej genes. In the current study, SEs genes were found in 57.1% (72/162) of MRSA isolates. Analysis of the toxin encoding genes in MRSA strains demonstrated that 34 strains (27%) harbored tst encoding gene, 20 strains (15.9%) pvl gene, three strains (2.4%) etb gene, and two strains eta gene (1.6%) (Figure 1). Distribution of enterotoxin and genetic resistance profiles are presented in Table 1. According to the results of SCCmec typing, 47 isolates (37.3%) harbored SCCmec type III, 29 isolates (23%) SCCmec type I, 18 isolates (14.3%) SCCmec type II, 17 isolates (13.5%) SCCmec type IV, and 15 isolates (11.9%) SCCmec type V.
According to the PCR-RFLP results, out of 126 MRSA isolates tested, int gene was found in 68 isolates (54%). Among these isolates, 43 (34.1%) carried class 1 integrons, 18 (14.3%) carried class 2 integrons, and seven (5.6%) carried class 1 and class 2, simultaneously (Figure 2). The characteristics related to the integron positive and negative MRSA isolates have been presented in Table 2. Abbreviations: AK, amikacin; AP, ampicillin; CD, clindamycin; CIP, ciprofloxacin; E, erythromycin; GM, gentamicin; T, tetracycline; TS, trimethoprim-sulfamethoxazole. a Genetic resistance profiles are presented in Table 1. Figure 1. Lane M, 100-bp DNA ladder (Fermentas, UK); lane 1 sea gene, lane 2 sei gene, lane 3 seg gene, lane 4 see gene, lane 5 sec, lane 6 seh gene, lane 7 sed gene, lane 8 seb gene, and lane 9 shj gene. Figure 2. The PCR-RFLP results for integrase gene products. Lane M, 100-pb DNA ladder; lane 1, HinfI and RsaI-treated products indicating class 1 integrons; lane 2, RsaI-treated products indicating class 2 integrons; lane 3, HinfI-treated products indicating class 2 integrons. The increasing emergence of resistance to currently available antimicrobial agents among MRSA strains exhibiting MDR pattern has limited the choice of therapeutic options and is becoming a serious threat to public health. Therefore, novel strategies are needed for the control of infections caused by MRSA strains (13, 15, 16). In the present study, resistance rates against ampicillin as a beta-lactam antibiotic, along with other antimicrobials, appear to be high, with the exception of amikacin (36.5%) and trimethoprim-sulfamethoxazole (31%), which is in accordance with the findings reported in Iran (13), Turkey (22), and Italy (23). High prevalence of resistance in tested MRSA isolates can be attributed to the indiscriminate use of antibiotics and poor implementation of measures, such as identification and effective control of MRSA strains and continuous and nationwide surveillance programs. Despite the recent data from Iran about the emergence of vancomycin-resistant S. aureus isolates (19), in the present study, all the MRSA isolates were susceptible to vancomycin. These findings represent the proper use and prescription guidelines of vancomycin in Iranian hospitals. Although during the two last decades, a significant trend towards increased fusidic acid resistance among MRSA isolates has been reported, the current findings indicated that none of the investigated isolates were resistant to fusidic acid. This result is in accordance with studies conducted by Aschbacher et al. (23) in Italy and Otokunefor et al. (24) in the UK. It has been well-documented that there are discrepant rates of MDR-MRSA prevalence in different geographic areas. In the present study, of the 126 MRSA isolates, 84.9% were defined as MDR, which is in line with reported results from Serbia (25) and Taiwan (26). In this study, out of 126 MRSA clinical isolates, 19 (15.1%) and 52 (41.3%) isolates showed iMLSB and cMLSB phenotype, respectively. In line with the current findings, Rashidi Nezhad et al. (13) from Iran reported that 52.6%, 12.6%, and 5.3% of their tested isolates showed cMLSB, iMLSB, and MLSB phenotypes, respectively. Lavallee et al. (27) in Canada reported that 64.7% and 35.3% of isolates had iMLSB and cMLSB phenotypes, respectively. Regarding the presence of aminoglycoside-modifying enzyme genes, as noted above, aac (6΄)-Ie/aph (2˝) (50%) was the most frequent gene followed by aph (3΄)-IIIa (25.4%) and ant (4΄)-Ia (16.7%), which is in contrast to the findings of Rashidi Nezhad et al. 's study (13) that reported ant (4')-Ia gene as the most prevalent gene (94.7%), followed by the aac (6′)/aph (2′′) (81.1%) and aph (3')-IIIa (31.6%) genes, respectively. In contrary, Ida et al. (28) and Yadegar et al. (29) reported the ant (4)-Ia gene as the most prevalent gene in 84.5% and 58% of S. aureus strains in comparison with other modifying enzyme genes. Analysis of macrolide resistance encoding genes indicated that resistance to erythromycin was due to msr (A) (38.1%) among MRSA isolates from Iran. The different rate of macrolide resistance genes was reported by several investigators (13). The observed differences reflected differences in policies related to antibiotic prescription, treatment protocols, and also dissemination of resistance gene in geographic regions, where the study was carried out. Regarding the ﬁndings of multiplex PCR, it was found that 57.1 % of the isolates contained at least one SE gene. Similarly, in a study on S. aureus producing enterotoxin isolated from skin infections, a relatively high prevalence of SEs (45%) was described (30). A study conducted in Turkey reported that 62.6% of S. aureus isolates were enterotoxigenic (31). A remarkable finding regarding the presence of staphylococcal enterotoxin genes was the high prevalence of sea (n = 34; 27%). Similar results were reported by Mashouf et al. indicating a prevalence of 25.5% of sea gene in S. aureus strains isolated from animal-originated foods (32). In a study conducted by Aydin et al. (31) in 2007 to 2008, the prevalence of sea genes was 8.6%. In contrast to the results of several studies, which showed that enterotoxin-like (SEl) toxin genes, mainly seg and sei, were found in isolates from patients rather than strains of food samples and food poisoning (31), the present study indicated classical enterotoxin genes (sea to see) were more common SEl genes. Based on previous reports, the most frequent toxin-encoding gene in MRSA isolated from clinical samples is tst (13, 14). As stated in Table 2, in 126 MRSA isolates, the presence of tst was detected in 34 strains (27%). The rate reported in the current study is approximately similar to the reported rate from Sweden (22%) (33) and lower than another study from Iran (32.6%) (13). In the current work, the pvl gene was detected in 15.9% of tested isolates. Previous published data by the current authors from Iran revealed PVL-MRSA carriage rate of 15.1% in 2017 (14). However, a high prevalence of PVL was reported by several investigators (4, 13, 14). In this study, the presence of eta gene was confirmed in two strains (1.6%), which was close to the study conducted in Colombia (3%) (34) and the reported rate from Iran (1.1%) (13). Consistent with the current results, several studies have indicated the low frequency of etb genes (13, 14). SCCmec type III is a common type reported in Iran (14), China (35), and Brazil (36), emphasizing the nosocomial origin of the strains. Similar to other studies that showed a higher percentage of tst genes among SCCmec type III (14), the present study showed that 48.9% of strains harbored SCCmec type III containing the tst gene (23/47). The other frequent SCCmec type identified in this study was type I (23%) followed by II (14.3). Conversely, in a study from Iran (published in 2017) conducted on 95 MRSA isolates collected from ICU patients, a prevalence of 5.3%. 2.1%, 22.1%, 57.9%, and 12.6% for types I - V, was documented, respectively (13). However, several reports have shown the various rates of SCCmec types I and II in examined isolates, albeit at a low level (13, 37). In this survey, SCCmec type IV and V were found in 13.5% and 11.5% of MRSA isolates. Inconsistent with the present results, Perez-Vazquez et al. (83.3%) reported high frequency of SCCmec type IV (37). Based on the present findings, the low frequency of SCCmec IV shows its lower mobility, compared to other SCCmec types. The present study indicated that all PVL-positive strains were from SCCmec IV and V classes. This finding is in line with previous results showing that nearly all PVL-positive strains belong to SCCmec IV (13, 14). As is generally accepted, integrons are key systems involved in spreading antibiotic multi-resistance among pathogenic bacteria. The present findings indicated class 1 integron as the most common type of integron (34.1%). On the other hand, class 2 integron was found in 14.3% of the isolates, while seven isolates (5.6%) carried both class 1 and 2 integrons. This, in agreement with other studies, shows that the percentages of integron class 1 is higher than integron class 2 (38). This finding is similar to a study by Xu et al. from China, which identified class 1 integrons in 53% of S. aureus isolates (39). The current results are inconsistent with a study by Guney from Turkey, which showed that the tested isolates did not harbor class 1 integrons (22). Recent evidence supports the hypothesis that class 1 integrons can act as antimicrobial resistance reservoirs in MRSA strains. Discrepancies in the prevalence of integron classes can be attributed to the different geographic regions, the bacteria strains, or indiscriminate and overuse of antibiotics. To summarize, the current findings indicated that SCCmec type III and class 1 integron were predominant among tested isolates with a high frequency of toxin, SEs, and resistance encoding genes. It can be deduced that simultaneous existence of these factors could confer to improve survival in various environments and lead to treatment failure. Therefore, identification and screening of integrons and SCCmec elements as reservoirs for various resistance genes could aim to select proper treatment protocols and also successful implementation of antibiotic stewardship and existing antibiotic resistance surveillance programs. The authors thank the Research Deputy of Shahid Beheshti University of Medical Sciences for funding of this study. The funder had no role in the study design, data collection, analysis and decision to publish or preparation of the manuscript. Authors' Contribution: Study concept and design, development of the study, data interpretation, and manuscript revision: Mehdi Goudarzi, Maryam Fazeli, and Hossein Goudarzi; phenotypic and molecular studies and manuscript drafting: Hossein Goudarzi, Anis Mohammadi, Mehdi Goudarzi and Fattaneh Sabzehali; performing experimental procedures: Anis Mohammadi, Mehdi Goudarzi, Fattaneh Sabzehali and Maryam Fazeli; participation in the acquisition of data and statistical analysis: Mehdi Goudarzi, Hossein Goudarzi and Maryam Fazeli; study supervision: Mehdi Goudarzi and Hossein Goudarzi. Conflict of Interests: The authors declare that they had no conflict of interests. Ethical Considerations: The Ethics Committee of Shahid Beheshti University of Medical Sciences (Tehran, Iran) also approved this study (IR.SBMU.MSP.REC.1396.809). Funding/Support: The present work was financially supported by a research grant from the Research Deputy of Shahid Beheshti University of Medical Sciences (Grant No. 12948). 1. Godaly G, Ambite I, Puthia M, Nadeem A, Ho J, Nagy K, et al. Urinary tract infection molecular mechanisms and clinical translation. Pathogens. 2016;5(1). doi: 10.3390/pathogens5010024. [PubMed: 26927188]. [PubMed Central: PMC4810145]. 2. Flores-Mireles AL, Walker JN, Caparon M, Hultgren SJ. Urinary tract infections: Epidemiology, mechanisms of infection and treatment options. Nat Rev Microbiol. 2015;13(5):269-84. doi: 10.1038/nrmicro3432. [PubMed: 25853778]. [PubMed Central: PMC4457377]. 3. Muder RR, Brennen C, Rihs JD, Wagener MM, Obman A, Stout JE, et al. Isolation of Staphylococcus aureus from the urinary tract: Association of isolation with symptomatic urinary tract infection and subsequent staphylococcal bacteremia. Clin Infect Dis. 2006;42(1):46-50. doi: 10.1086/498518. [PubMed: 16323090]. 4. Baba-Moussa L, Anani L, Scheftel JM, Couturier M, Riegel P, Haikou N, et al. Virulence factors produced by strains of Staphylococcus aureus isolated from urinary tract infections. J Hosp Infect. 2008;68(1):32-8. doi: 10.1016/j.jhin.2007.10.010. [PubMed: 18069084]. 5. Chambers HF, Deleo FR. Waves of resistance: Staphylococcus aureus in the antibiotic era. Nat Rev Microbiol. 2009;7(9):629-41. doi: 10.1038/nrmicro2200. [PubMed: 19680247]. [PubMed Central: PMC2871281]. 6. Lim WW, Wu P, Bond HS, Wong JY, Ni K, Seto WH, et al. Determinants of methicillin-resistant Staphylococcus aureus (MRSA) prevalence in the Asia-Pacific region: A systematic review and meta-analysis. J Glob Antimicrob Resist. 2019;16:17-27. doi: 10.1016/j.jgar.2018.08.014. [PubMed: 30145271]. 7. Boye K, Bartels MD, Andersen IS, Moller JA, Westh H. A new multiplex PCR for easy screening of methicillin-resistant Staphylococcus aureus SCCmec types I-V. Clin Microbiol Infect. 2007;13(7):725-7. doi: 10.1111/j.1469-0691.2007.01720.x. [PubMed: 17403127]. 8. Davies J, Davies D. Origins and evolution of antibiotic resistance. Microbiol Mol Biol Rev. 2010;74(3):417-33. doi: 10.1128/MMBR.00016-10. [PubMed: 20805405]. [PubMed Central: PMC2937522]. 9. Gillings MR. Integrons: Past, present, and future. Microbiol Mol Biol Rev. 2014;78(2):257-77. doi: 10.1128/MMBR.00056-13. [PubMed: 24847022]. [PubMed Central: PMC4054258]. 10. Cambray G, Guerout AM, Mazel D. Integrons. Annu Rev Genet. 2010;44:141-66. doi: 10.1146/annurev-genet-102209-163504. [PubMed: 20707672]. 11. Japoni-Nejad A, Rezazadeh M, Kazemian H, Fardmousavi N, van Belkum A, Ghaznavi-Rad E. Molecular characterization of the first community-acquired methicillin-resistant Staphylococcus aureus strains from Central Iran. Int J Infect Dis. 2013;17(11):e949-54. doi: 10.1016/j.ijid.2013.03.023. [PubMed: 23706379]. 12. Clinical and Laboratory Standards Institute (CLSI). Performance standards for antimicrobial susceptibility testing; 22th Informational Supplement. CLSI document M100-S22 (ISBN 1-56238-805-3). 2017. 13. Rashidi Nezhad R, Meybodi SM, Rezaee R, Goudarzi M, Fazeli M. Molecular characterization and resistance profile of methicillin resistant staphylococcus aureus strains isolated from hospitalized patients in intensive care unit, Tehran-Iran. Jundishapur J Microbiol. 2017;10(3). doi: 10.5812/jjm.41666. 14. Goudarzi M, Bahramian M, Satarzadeh Tabrizi M, Udo EE, Figueiredo AM, Fazeli M, et al. Genetic diversity of methicillin resistant Staphylococcus aureus strains isolated from burn patients in Iran: ST239-SCCmec III/t037 emerges as the major clone. Microb Pathog. 2017;105:1-7. doi: 10.1016/j.micpath.2017.02.004. [PubMed: 28179118]. 15. Hoseini Alfatemi SM, Motamedifar M, Hadi N, Sedigh Ebrahim Saraie H. Analysis of virulence genes among methicillin resistant Staphylococcus aureus (MRSA) strains. Jundishapur J Microbiol. 2014;7(6). e10741. doi: 10.5812/jjm.10741. [PubMed: 25371805]. [PubMed Central: PMC4217665]. 16. Ardic N, Sareyyupoglu B, Ozyurt M, Haznedaroglu T, Ilga U. Investigation of aminoglycoside modifying enzyme genes in methicillin-resistant staphylococci. Microbiol Res. 2006;161(1):49-54. doi: 10.1016/j.micres.2005.05.002. [PubMed: 16338590]. 17. Martineau F, Picard FJ, Lansac N, Menard C, Roy PH, Ouellette M, et al. Correlation between the resistance genotype determined by multiplex PCR assays and the antibiotic susceptibility patterns of Staphylococcus aureus and Staphylococcus epidermidis. Antimicrob Agents Chemother. 2000;44(2):231-8. doi: 10.1128/AAC.44.2.231-238.2000. [PubMed: 10639342]. [PubMed Central: PMC89663]. 18. Udo EE, Jacob LE, Mathew B. Genetic analysis of methicillin-resistant Staphylococcus aureus expressing high- and low-level mupirocin resistance. J Med Microbiol. 2001;50(10):909-15. doi: 10.1099/0022-1317-50-10-909. [PubMed: 11599741]. 19. Azimian A, Havaei SA, Fazeli H, Naderi M, Ghazvini K, Samiee SM, et al. Genetic characterization of a vancomycin-resistant Staphylococcus aureus isolate from the respiratory tract of a patient in a university hospital in northeastern Iran. J Clin Microbiol. 2012;50(11):3581-5. doi: 10.1128/JCM.01727-12. [PubMed: 22933598]. [PubMed Central: PMC3486207]. 20. Monday SR, Bohach GA. Use of multiplex PCR to detect classical and newly described pyrogenic toxin genes in staphylococcal isolates. J Clin Microbiol. 1999;37(10):3411-4. [PubMed: 10488222]. [PubMed Central: PMC85588]. 21. Japoni A, Gudarzi M, Farshad S, Basiri E, Ziyaeyan M, Alborzi A, et al. Assay for integrons and pattern of antibiotic resistance in clinical Escherichia coli strains by PCR-RFLP in Southern Iran. Jpn J Infect Dis. 2008;61(1):85-8. [PubMed: 18219144]. 22. Guney AK. A study on class i integrons and antimicrobial resistance among clinical staphylococci isolates from a Turkish hospital. Clin Microbiol. 2014. 23. Aschbacher R, Pichon B, Spoladore G, Pagani E, Innocenti P, Moroder L, et al. High clonal heterogeneity of Panton-Valentine leukocidin-positive meticillin-resistant Staphylococcus aureus strains from skin and soft-tissue infections in the Province of Bolzano, Northern Italy. Int J Antimicrob Agents. 2012;39(6):522-5. doi: 10.1016/j.ijantimicag.2012.02.004. [PubMed: 22481056]. 24. Otokunefor K, Sloan T, Kearns AM, James R. Molecular characterization and panton-valentine leucocidin typing of community-acquired methicillin-sensitive Staphylococcus aureus clinical isolates. J Clin Microbiol. 2012;50(9):3069-72. doi: 10.1128/JCM.00602-12. [PubMed: 22718937]. [PubMed Central: PMC3421788]. 25. Cirkovic I, Stepanovic S, Skov R, Trajkovic J, Grgurevic A, Larsen AR. Carriage and genetic diversity of methicillin-resistant Staphylococcus aureus among patients and healthcare workers in a Serbian university hospital. PLoS One. 2015;10(5). e0127347. doi: 10.1371/journal.pone.0127347. [PubMed: 25993538]. [PubMed Central: PMC4439055]. 26. Wang WY, Chiueh TS, Sun JR, Tsao SM, Lu JJ. Molecular typing and phenotype characterization of methicillin-resistant Staphylococcus aureus isolates from blood in Taiwan. PLoS One. 2012;7(1). e30394. doi: 10.1371/journal.pone.0030394. [PubMed: 22291948]. [PubMed Central: PMC3264593]. 27. Lavallee C, Rouleau D, Gaudreau C, Roger M, Tsimiklis C, Locas MC, et al. Performance of an agar dilution method and a Vitek 2 card for detection of inducible clindamycin resistance in Staphylococcus spp. J Clin Microbiol. 2010;48(4):1354-7. doi: 10.1128/JCM.01751-09. [PubMed: 20164285]. [PubMed Central: PMC2849538]. 28. Ida T, Okamoto R, Shimauchi C, Okubo T, Kuga A, Inoue M. Identification of aminoglycoside-modifying enzymes by susceptibility testing: Epidemiology of methicillin-resistant Staphylococcus aureus in Japan. J Clin Microbiol. 2001;39(9):3115-21. doi: 10.1128/JCM.39.9.3115-3121.2001. [PubMed: 11526138]. [PubMed Central: PMC88306]. 29. Yadegar A, Satri M, Mozafari N. Pervalence ant (4')-Ia gene among nosocomial methicillin resistant Staphylococcus aureus by multiplex-PCR. MJMS. 2010;1:59-68. 30. Imanifooladi AA, Sattari M, Peerayeh SN, Hassan ZM, Hossainidoust SR. Detection the Staphylococcus aureus producing enterotoxin isolated from skin infections in hospitalized patients. Pak J Biol Sci. 2007;10(3):502-5. doi: 10.3923/pjbs.2007.502.505. [PubMed: 19069525]. 31. Aydin A, Sudagidan M, Muratoglu K. Prevalence of staphylococcal enterotoxins, toxin genes and genetic-relatedness of foodborne Staphylococcus aureus strains isolated in the Marmara Region of Turkey. Int J Food Microbiol. 2011;148(2):99-106. doi: 10.1016/j.ijfoodmicro.2011.05.007. [PubMed: 21652103]. 32. Mashouf RY, Hosseini SM, Mousavi SM, Arabestani MR. Prevalence of enterotoxin genes and antibacterial susceptibility pattern of Staphylococcus aureus strains isolated from animal originated foods in west of Iran. Oman Med J. 2015;30(4):283-90. doi: 10.5001/omj.2015.56. [PubMed: 26366263]. [PubMed Central: PMC4561649]. 33. Nowrouzian FL, Dauwalder O, Meugnier H, Bes M, Etienne J, Vandenesch F, et al. Adhesin and superantigen genes and the capacity of Staphylococcus aureus to colonize the infantile gut. J Infect Dis. 2011;204(5):714-21. doi: 10.1093/infdis/jir388. [PubMed: 21844297]. 34. Jimenez JN, Ocampo AM, Vanegas JM, Rodriguez EA, Garces CG, Patino LA, et al. Characterisation of virulence genes in methicillin susceptible and resistant Staphylococcus aureus isolates from a paediatric population in a university hospital of Medellin, Colombia. Mem Inst Oswaldo Cruz. 2011;106(8):980-5. doi: 10.1590/S0074-02762011000800013. [PubMed: 22241120]. 35. Chen X, Yang HH, Huangfu YC, Wang WK, Liu Y, Ni YX, et al. Molecular epidemiologic analysis of Staphylococcus aureus isolated from four burn centers. Burns. 2012;38(5):738-42. doi: 10.1016/j.burns.2011.12.023. [PubMed: 22360963]. 36. Rodrigues MV, Fortaleza CM, Riboli DF, Rocha RS, Rocha C, da Cunha Mde L. Molecular epidemiology of methicillin-resistant Staphylococcus aureus in a burn unit from Brazil. Burns. 2013;39(6):1242-9. doi: 10.1016/j.burns.2013.02.006. [PubMed: 23597850]. 37. Perez-Vazquez M, Vindel A, Marcos C, Oteo J, Cuevas O, Trincado P, et al. Spread of invasive Spanish Staphylococcus aureus spa-type t067 associated with a high prevalence of the aminoglycoside-modifying enzyme gene ant(4')-Ia and the efflux pump genes msrA/msrB. J Antimicrob Chemother. 2009;63(1):21-31. doi: 10.1093/jac/dkn430. [PubMed: 18948410]. 38. Mostafa M, Siadat SD, Shahcheraghi F, Vaziri F, Japoni-Nejad A, Vand Yousefi J, et al. Variability in gene cassette patterns of class 1 and 2 integrons associated with multi drug resistance patterns in Staphylococcus aureus clinical isolates in Tehran-Iran. BMC Microbiol. 2015;15:152. doi: 10.1186/s12866-015-0488-3. [PubMed: 26228695]. [PubMed Central: PMC4521504]. 39. Xu Z, Shi L, Zhang C, Zhang L, Li X, Cao Y, et al. Nosocomial infection caused by class 1 integron-carrying Staphylococcus aureus in a hospital in South China. Clin Microbiol Infect. 2007;13(10):980-4. doi: 10.1111/j.1469-0691.2007.01782.x. [PubMed: 17803751].